Maybe it’s only because I recently compared personal finance to Vegemite, but I like this guy: he has the gumption [AJC: don’t think this is the right word; any ideas?] 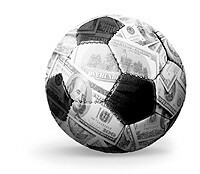 to compare soccer to personal finance, then actually make it make sense! Spain is Soccer World Cup 2010 Champion. Analysts say that is because of their mental strength, their wily forwards, a strong defence and the hardworking midfield. Apart from the mental strength, which is invisible, what’s visible on the field are three important components. 1. Forwards, to score the goals. 2. Midfielders, to control the game. 3. Defenders, to save, not leak goals. I know you have this idea that I would be comparing soccer with Personal Finance. Here it is. Personal Finance has three important components too. 1. Investing, to get more bang on your money. 2. Maximizing your income, to control the game of money. 3. Frugality, to save and not leak money. And yes, you also need to have that mental strength not to be dragged down by “fear and greed”. And keep coming back even after failure. This entry was posted in money and tagged 7million, 7million7years, Investing, millionaire, Rich, wealth by Adrian. Bookmark the permalink.